In August, Nicole and I traveled together in Europe for a few weeks before starting The Love of a Master Israel Tour. I took last year’s trip alone, because Nicole was helping to take care of her father, Owen Campbell, in Australia until he passed away in December. God bless his Soul. So this time, it was really nice to have Nicole by my side on the road again, to experience all the miracles and phenomena, just like on the J-R trips. Our travels began in Amsterdam with David and Kathryn Allen. We took an electric boat cruise through the canals and cherished the fellowship and Satsang with the Allens. Then we visited Claudie and Guillaume Botté in Toulouse, France, where the heat was scorching. We were struck by the distinctive architecture in that area, more similar to Spain than the rest of France, with its proximity to the Pyrenees mountain range. While we stayed with the Bottés, they were doing the Transcendent Leadership program, so the energy in their home was really powerful and we loved being there. Next, we went to other parts of France for some fabulous private touring with Véronique Sandoz, until we left for Sofia, Bulgaria. This was quite an experience. It was really wonderful to be in fellowship with Hristina Kirimidchieva, Georgi Markov, and many of the MSIA ministers there. “Where two or more are gathered…” We did a book signing, took sharing, hosted a J-R video marathon, and screened the Mystical Traveler movie with Bulgarian subtitles. And I spoke a lot about my experiences of living and working with Dr. John-Roger. Then Hristina and Georgi took Nicole and me on their incredible version of a Bulgarian tour, and absolutely spoiled us the entire way. We went to tiny little villages where they make the authentic, natural, world-famous Bulgarian yogurt (which they call simply, “sour milk”) with their natively grown Lactobacillus bulgaricus probiotic. We also tasted fresh honey right from the bees and picked our own wild berries and smelled real Rose Oil. This was near the Seven Lakes region, where the Universal White Brotherhood, a New Age religious movement, was founded in the early 20th century by Peter Deunov. Each of the Seven Lakes is a different metaphor or symbol, the last one representing SOUL. As we visited each lake in the sequence, it felt similar to our process walking the labyrinth or rising up through the chakra system. I experienced it as a very similar energy to Lake Titicaca in the Andes of South America. John Morton approved an ordination and initiations for a fellow MSIAer in Switzerland and Greece. Hristina didn’t hesitate to drive us to another country! We found ourselves in Larissa, Greece, close to Olympiaki Akti or Olympic Beach. This really gave us the whole European flavor, like one giant pot with a variety of foods. At the beach were Greeks, Bulgarians, and Russians…all sorts of people from different countries, all mixed up, just bathing on a really beautiful beach together. We baptized each other in the Aegean Sea. First time for me. And then we were off to an experience I’ve not had since J-R was still alive, on our last trip in September 2014, when a group of us celebrated his birthday in Israel, Jerusalem, and Palestine. 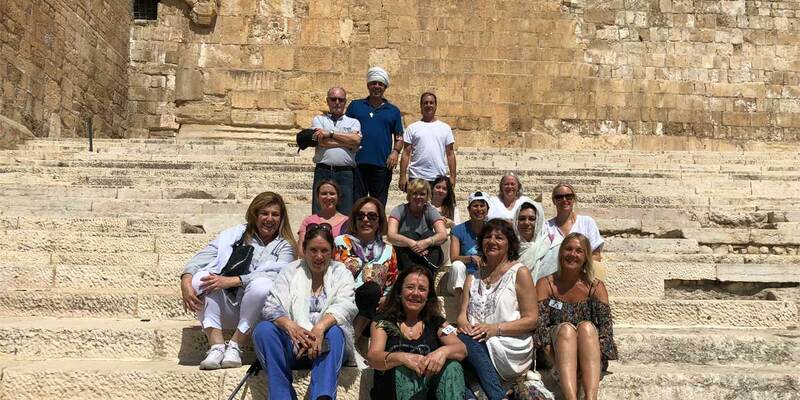 I co-led this 12-day Israel trip with Benji Shavit of Regina Tours. It was a small, intimate group of only 15 people, mostly women—half U.S. citizens and almost half Latin Americans with one Australian. We kept the cost as affordable as possible for the participants. The evening the group landed in Tel Aviv on September 17th, we held a group welcome session where we all met each other, reviewed the itinerary, and handed out tour t-shirts, nametags, and luggage tags…it truly felt like J-R was present, just like the old days. The tour officially began on September 18th which happened to be the sacred Jewish holy day of Yom Kippur, dedicated to atonement and forgiveness from the past year. We started with baptisms in the River Jordan to clear and align with the Spirit and our Inner Masters. On previous trips, John Morton was always the instructor who demonstrated how to perform and partake in the baptism process, so I really missed him being there. But this time, I found myself taking on that role! We observed Yom Kippur that night at a local synagogue, then held a three-day meditation retreat in Kfar Kisch, a little village at the base of Mount Tabor, near the Galilee region. Participants walked back and forth from their different Airbnb housing in the village, and all our breakfasts and lunches were prepared organically by Benji, his son Gilad, daughter-in-law Mia, along with a woman named Karen. We were treated like royalty in his vineyard, and took side trips to Mount of Beatitudes and finally Mount of Transfiguration. The workshop was beautiful, including the Luxor Meditation daily and nothing but J-R videos—an amazing experience of feeling him at every moment. Next, we went into Jerusalem for three days, starting with the traditional Mount of Olives toast blessing. We went to Temple Mount, the Western Wall, and visited the different quarters of the Old City: Armenian, Jewish, Muslim, and Christian. We took a side trip to the Church of the Nativity in Bethlehem. On September 24th the group and some special guests enjoyed a celebratory John-Roger 84th Birthday Dinner at the Notre Dame Rooftop Cheese and Wine Restaurant overlooking the Old City. One of my USM classmates who’s Israeli, Helena Shoshana, and Barbara Schwarck the MSIA Rep from Pennsylvania also showed up for the dinner. We were in time to see the sun set over the Old City. It was beautiful. So I thank J-R for everything. Thank you. Following our incredible time in Jerusalem, two days were spent in the Dead Sea area. Because we weren’t allowed to climb Masada, we took the aerial trams up to the top. It felt like J-R was walking with us and was in the front of the bus with me and Benji. We also toured the Qumran caves, where the famous Dead Sea Scrolls were discovered in 1946/47, and many in our group did the mud packs and floated in the highly alkaline Dead Sea, which is considered to be the lowest place on earth. Benji was amazing the entire time…he even translated in both English and Spanish! We met Shraga and ended with a small Blessings Dinner close to Ben Yehuda Street near the Jaffa Gate outside the Old City. It was very nice to be back on the saddle leading a trip. So, I do have in mind that there will be another trip for me. I’m trying to tap in to J-R inside of me and see what’s clear in terms of the next destination, but it was an incredible experience. Stay tuned. Then I flew off to London with Nicole to do more initiations and I celebrated my 55th birthday with a J-R Marathon and The Love of a Master book signing event in Borde Hill, hosted by AJ and Eleni Clarke and Nathalie Franks. Nat Sharratt came over one day from France, where he had a fashion show for his business. We met at the Carlton Towers and rekindled the memories of the times we were there with J-R, Delile and Elda Hinkins, and all the groups. A lot of MSIAers came out to the J-R marathon—it was awesome. Thanks to all of you guys for indulging me in my Jesus Garcia ministries, sharing, Satsanging with J-R energy, and sharing my experiences with J-R.
Nicole and I had some spiritual work to do up in Scotland, where we spent a night and two days. She headed off to Roslyn Chapel to plant more light columns there. I remember celebrating J-R’s birthday in 2011, when John took a few people to Roslyn Chapel which is very cool. It’s not far from Edinburgh, about 30 minutes, and then we took a train back to London. I really enjoyed sharing the trips with Nicole that we did with J-R. It’s beautiful to have someone, like I had with J-R, that you can just share those moments together. In other news, I am excited to share that The Love of a Master book will soon be translated into Chinese! I’m off soon to do another Love of a Master tour in Latin American in Mexico, Colombia, Chile, Argentina, and Brazil. Check out the photos from Jsu’s travels!